Spinal surgeries are of one the most delicate surgical operations as compared with other bone surgeries, not that the other ones aren’t complex. A Spinal Implant requires optimum attention, absolute skill and concentration on part of the surgeons. While same amount of care and perfection is needed on the part of manufacturers when preparing these spine implant and instruments, this is exactly where we at Orthopedic-Implants.Net step in. Extreme shock or stress, literal harm can ruin the spine which plainly holds a person together. Any damage to the spine means fatal injuries which ought to be treated immediately and with tremendous care. 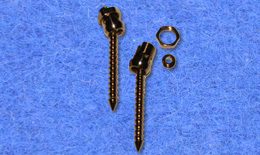 The various spine instruments used in a spine orthopedic treatment while doing a spinal implants surgery are Mono Axial Pedicle Screw Set, Poly Axial Pedicle Screw Set, Pedical Screws Set, Side Opening, Transverse connector, Cannulated screw set, Link rod, Staple, Connection Rod, Steffee Plate, Cervical Spine, Laminactomy Set, Spinal Cage Tubular and other devices. These are all sophisticated spine instruments and extremely well checked before used in surgery. This is why many hospital authorities have opted for Orthopedic-Implants.Net that is a division D4 Surgicals India Pvt. Ltd. When it comes to spine orthopedic treatment, the advancement in science which has seen a better surgical procedure while performing spinal implants surgery has greatly helped in curing off a number of patients. The casualties have also come down as there is better chance of recovery with these spine instruments today. In India, We are the leading exporters and suppliers of these high end sophisticated instruments for spine orthopedic treatment. The spine implants are thus extremely reliable, made of stainless steel or titanium as per the options considered by a patient or doctor. The prices again are reasonable and positive result post a spinal implant surgery is extremely high. Although surgeons go through various tests and do consider the pros and cons of a spine orthopedic treatment, but like said before when dealing with a delicate and vital bone structure as the spine, these devices are the best options available today. We provide various types of spinal implants like mono axial pedicle screw, poly axial titanium screws, steffee plates, connection rods, spinal cage, cervical spine, etc at reasonable cost. We are orthopedic spinal implant and instrument manufacturer and supplier in India.